Cele-Bret Erie not your thing? Go to this instead. There is something so distinct about the sound of a can of spray paint being shaken, like the dice to a game of craps being shot from a tin cup – the metal peas bouncing from top to bottom, side to side, stirring a liquid that will soon adorn a decrepit brick wall, a rust-spotted freight train, or the dark sides of an underpass. The next sound is equally unmistakable; it's the light, toneless, whistle of a colorful mist, spraying life onto stone or steel through a small valve cap. The paint hits the wall in small blasts; graceful motions from a steady hand guide the streaks of color through transition of contour strokes and thin lines. When the piece is finished, it'll be adored by those who pass by and take the time to admire it – without the interruption of a curator's input – or on the flipside, the piece itself could pass you by, by way of freight train. And there too – posted up by the tracks – you'll find enthusiasts taking in these nomadic exhibits. It's all about the sights, sounds, the message, and the motion. It's all about hip-hop. A culture upheld by four essential elements, hip-hop blends rhyme spittin' MCing, DJs keepin' the beat, the B-Boys break dancin' in the street, and the graffiti writers benchin' it or brightening up the scene. "Not only are we graffiti writers, but we're benchers, we like to just sit and watch graffiti and enjoy it," says owner of Steadfast Tattoo Parlor and Bencher's Union co-founder Joel "Suga Bear" Brennan. Benchin' is the act of kicking back; taking the time to study and simply appreciate the elegant works that blanket passing freight train cars. When a taste for hip-hop culture is acquired, a city's barren wall can serve as a kitchen, its venues' stages a table for feasting, and all those present for the festivities are united by the captivating elements of this artistic sustenance: Hence The Bencher's Union, a progressive group of artists who come to use their collective creativity to turn portions of lifeless city scape into stunning murals. Coming from New York City, Suga Bear was eager to bring this urban culture to Erie, realizing and need and a niche for such colorful traditions in an occasionally drab city. Before opening Steadfast Tattoo Parlour, he had been working at Ink Assassins where he met some of the chief teamsters in this union. Six years ago, this group of Benchers started as a small circle of friends that had come together simply for art's sake just to paint a wall – in this case, Raven Sound's exterior. Over a shared passion for hip-hop and its culture, a friendship transpired between Suga and – at the time co-owner of 2189 Skateshop, which capped this corner spot inkwell – Jason "Iggy" Imig. From a young age, Iggy started promoting local shows, booking punk-rock bands at the Continental Ballroom in the '80s, and later found an interest in hip-hop acts. 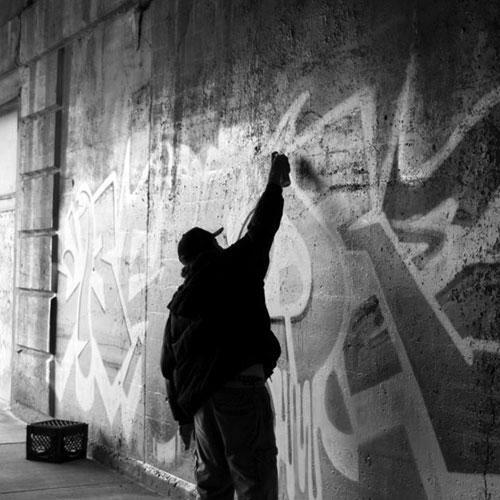 When Suga took an interest in promoting a hip-hop show at Forward Hall in 2009 to coincide with this "Graffiti Gathering," the bond solidified. "There has never really been a huge underground hip-hop scene," says Iggy, about Erie's often-times limited selection of live entertainment. So he took it upon himself to help out others with a similar passion for this genre and culture. 2011 marked the first official Bencher's Union with the help of co-founder Danny "Gamble" Babcock of High Level Art, a company that specializes in murals, signs, and exclusive custom projects. "Together we said, 'let's make a hip-hop event,'" Suga puts it simply. Originally from Cincinnati, Gamble had found inspiration from events like Scribble Jam, a festival that showcased all of hip-hop's elements in one celebration. While the event last occurred in 2008, it added to Suga and Gamble's motivation to repaint the picture. Not only does Bencher's Union celebrate this culture, but it also merges style. Suga's graffiti maintains an old-school freight-train style art form while Gamble's puts the weight on the modern side of the scale. "I think what allows events like this to happen is a city mentality where multiple cultures get together and there is an expression of art," Suga says. In recent years, thanks to Jim Berlin, CEO of Logistics Plus for offering his wall to the world of art – in this case graffiti – the Bencher's Union now congregates around a capacious centerpiece, a stone canvas that stretches from Sassafras Street to Peach Street. You may think with the negative connotation of graffiti being the equivalent to vandalism that getting the go-ahead would be difficult, but Erie is home to some progressive minds. "It's actually not that hard. You just walk in and say, 'Hey, I want to paint your wall…' If you have a city mentality, you see things like [Bencher's Union] as a growth in culture. Who is anybody to really say, 'No' to that?" Like one wall of a box, graffiti relies on the other three to secure the whole package. To fully celebrate hip-hop culture, you also need the motion, the music, and the message. While Iggy started pulling in some local and regional hip-hop artists to play for the weekend, he asked Jon Box, co-founder of The Box 814 - a socially conscious Erie clothing company - to help sponsor the weekend-long event. Jon was delighted as the hip-hop scene in Erie has not always had an easy time flourishing, and he believes there is more to this culture than meets the eye and ear. "The fifth element of hip-hop is knowledge," Jon says. "There's a stigma associated with hip-hop shows… we're slowly changing that." While Bencher's Union may be coinciding with Celebrate Erie, it's also an opportunity for knowledge to spread, that hip-hop culture enriches and beautifies our surroundings and its traditions can thrive in this city. On August 16, 17, and 18 The Bencher's Union, in coordination with the Box, will be celebrating hip-hop culture all weekend long. Drop by Basement Transmissions [1501 State St.] Friday to get your music fix with Beedie; Saturday go to the wall that follows the train tracks spanning from Sassafras Street to Peach Street, and "bench it" for a while, as you'll be able watch this city's walls come alive; and finally, on Sunday night, come watch the B-Boys battle it out outside the crooked i.
Matthew Flowers can be contacted at mFlowers@ErieReader.com, and you can follow him on Twitter @MFlowersER.